attached neck roll for noise reduction. Thank you for choosing a Nolan® helmet. BUT ALWAYS REMEMBER THAT THE UTMOST CARE AND  CAUTION ARE YOUR BEST POSSIBLE PROTECTION WHENEVER YOU RIDE A MOTORCYCLE! 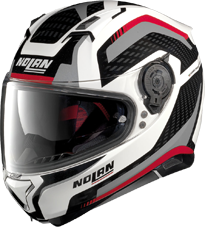 By this LIMITED WARRANTY CERTIFICATE, Nolan® and X-Lite® guarantee to the original purchaser of the helmet that the product is free from all material and manufacturing defects at the time of  purchase. 5 (FIVE) YEARS AFTER THE DATE OF PURCHASE OR 7 (SEVEN) YEARS AFTER THE DATE OF MANUFACTURE(PRINTED ON THE LABEL SEWN INSIDE THE HELMET) THIS LIMITED WARRANTY SHALL LAPSE ENTIRELY. AFTER THAT PERIOD,  WE STRONGLY ADVISE YOU TO REPLACE YOUR HELMET FOR YOUR OWN SAFETY. CERTAIN ENVIRONMENTAL FACTORS,  IMPROPER USE OF THE PRODUCT, ACCIDENTAL IMPACTS, NORMAL EXTERNAL AND INTERNAL WEAR AND TEAR,  INVOLVEMENT IN ACCIDENTS, HOWEVER MINOR, ETC., MAY HAVE SERIOUSLY INFLUENCED THE MECHANICAL OR  PHYSICAL CHARACTERISTICS OF THE PRODUCT, THEREBY IMPAIRING ITS PROPERTIES. This review comes with the caveat that I have not used any other helmets of a similar style to give a good comparison. I also wanted to get a few more rides in before I reviewed, but midwest United States winters are a bit cold. Overall, it's a good solid helmet. I was looking for an open face helmet that still had a full face shield, and something with an old school style to go with my 07 Triumph Thruxton. This helmet fit the bill and had the integral sun visor, which is a nice plus. I'm always getting compliments on how good it looks. I suppose that could be just me getting the compliments, but I'm happy to pass some of the love onto the helmet too. Being an open face helmet, it's not going to be completely silent, and it's not intended to be a long distance helmet. It's lightweight and overall pretty comfortable. My note on comfort is that with the "closed" design of the interior padding, it stays close to my head and my ears tend to get pretty warm. I don't know if it's an overall design flaw or just my helmet, but the seal at the top of the shield with the shield down all the way isn't great. With the sun visor down, it's not noticeable, as the visor is enough of a baffle to keep air from moving through, but with the sun visor retracted, air moves through at the top. As noted above, this is fine to get some more air moving when my ears are warm, but in the evening or night when the sun visor isn't usable, this is just cold air coming in. 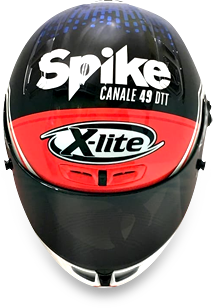 All in all, it's a great helmet for what I use it for, and I'd definitely recommend it.